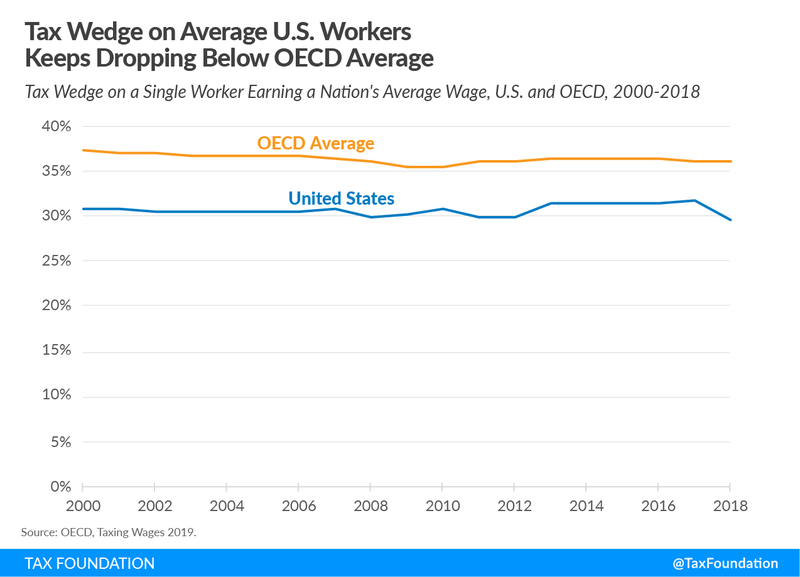 A new report from the Organisation for Economic Co-operation and Development (OECD) shows that the U.S. tax wedge—the difference between total labor costs to the employer and the corresponding net take-home pay of the employee—declined from 2017 to 2018. That outcome, as detailed in Taxing Wages 2019, is primarily because of the individual income tax cuts in the Tax Cuts and Jobs Act (TCJA). The OECD calculates the tax wedge by taking “the sum of personal income tax, employee and employer social security contributions plus any payroll taxes, minus any benefits received by the employee, as a percentage” of labor costs. In other words, the average tax wedge measures the part of labor costs taken in tax and social security contributions net of cash benefits. The following chart, using OECD data, shows that the U.S. tax wedge fell by 2.19 percentage points in 2018, from 31.8 in 2017 to 29.6 percent. Behind the decrease in the U.S. tax wedge was the TCJA’s individual income tax cuts. According to the OECD, the 2.19 percentage-point decrease was overwhelmingly caused by a decline in the income tax, which fell by 2.14 percentage points; a decrease of the payroll tax accounted for the remaining .06 percentage points. The TCJA’s lowering of most individual income tax rates, along with several other changes, reduced tax bills for 80 percent of taxpayers in 2018. Lower taxes mean a higher net take-home pay, and therefore a smaller tax wedge. Only one other OECD country, Estonia, saw a greater percentage-point decrease. The tax wedge increased in 22 countries and fell in 14, for a decrease in the OECD average from 36.2 to 36.1. Although the U.S. tax wedge has consistently been below the OECD average, it is now even further below. 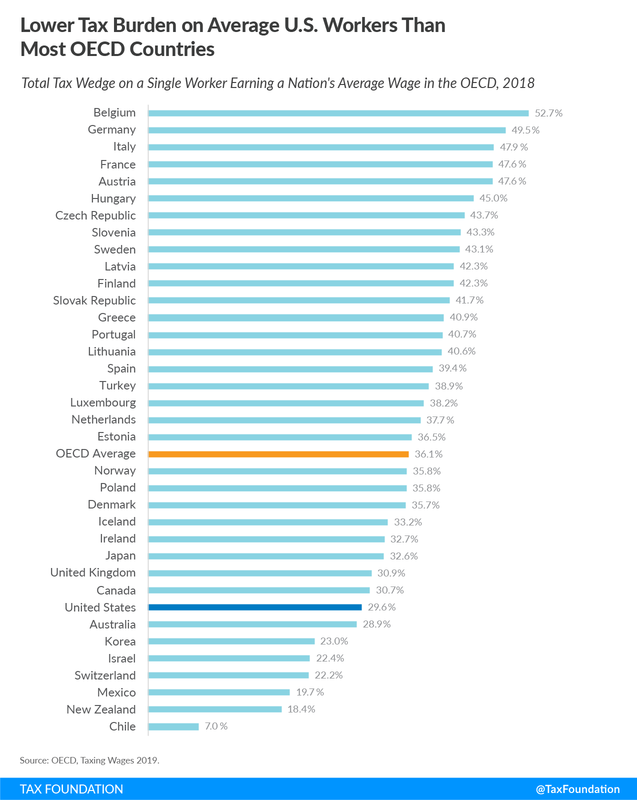 As the following chart illustrates, most OECD countries impose a higher tax burden on average wage earners than the U.S. does. Belgium has the largest tax wedge at 52.7 percent, followed by Germany (49.5 percent) and Italy (47.9 percent). Chile has the lowest at 7.0 percent, followed by New Zealand (18.4 percent) and Mexico (19.7 percent). In 2018, the U.S. had the 8th lowest tax wedge, versus 10th in 2017. Recognizing the impact of policy changes can often be difficult. However, the OECD data shows one effect of the TCJA: lower individual income taxes have reduced the U.S. tax wedge temporarily, bringing it further below the OECD average. Oregon is moving closer to enacting a new gross receipts tax to support public education funding. The Joint Committee on Student Success is holding public hearings on House Bill 3427, which outlines improvements to the state’s public education system. Revenue from the proposed gross receipts tax would support the Student Success Fund, which is the funding mechanism for public education improvements. The amendment to House Bill 3427 outlines the proposed Corporate Activity Tax and the reduction in personal income tax rates. The first three brackets will be reduced by 0.25 percentage points, while the top bracket starting at taxable income over $125,000 will remain at 9.9 percent. This change will be effective for the 2020 tax year. The Corporate Activity Tax would tax business receipts received “in the regular course of the person’s trade of business, without deduction for expenses incurred by the trade or business,” but also exempts certain types of business receipts, such as dividends received and interest income. These forms of income are exempt because this would incorporate the returns from investment into the tax base, when policymakers are trying to tax receipts from the sale of goods and services in Oregon. Business receipts from the wholesale or retail sale of motor fuel, cigarettes and tobacco products, alcohol, and groceries also would be exempt from the Corporate Activity Tax. Motor fuel oil, cigarettes, tobacco, and alcohol have industry-specific tax regimes in Oregon. Groceries were made exempt to reduce the expected harm the tax would impose on low-income Oregonians. The Corporate Activity Tax would be assessed on business receipts sourced in Oregon on a destination basis. For intangible property, for example, the business receipt from the transaction would be considered taxable if the intangible property is delivered to a consumer in Oregon. Business receipts sourced from outside the state are exempt from the tax. Oregon’s Department of Revenue (DOR) may create regulations to provide more guidelines on sourcing for complicated tax situations. DOR will require any business to register with it if they collect business receipts of at least $500,000. Businesses with less than $1 million in receipts would pay a flat $250 tax, while those with more would be taxed at a 0.49 percent rate for receipts in excess of the $1 million threshold. The proposal conforms to how the federal government accounts for business receipts, labor costs, and the cost of business inputs. Business inputs include the cost of goods sold and the cost of businesses held in inventory. Labor costs include salary, wages, and benefits paid on behalf of the employee. Additionally, subsidiary and affiliated firms would be consolidated for the purposes of the tax, and transactions between these firms would not be subject to the Corporate Activity Tax. Before businesses can take the 25 percent deduction against business receipts for the cost of business inputs or labor costs, they must apportion these costs based on Oregon’s single sales factor. Put simply, this means that firms operating in states in addition to Oregon must use the ratio of Oregon sales to their total sales nationwide and multiply it by their labor costs or cost of business inputs. This ensures that the costs that firms deduct from their business receipts are related to goods or services sold in Oregon and not other states. House Bill 3427 would preempt localities from creating new taxes on business receipts. This preemption would be effective as of March 1, 2019, which would grandfather in the 1 percent gross receipts tax enacted by Portland in late 2018. 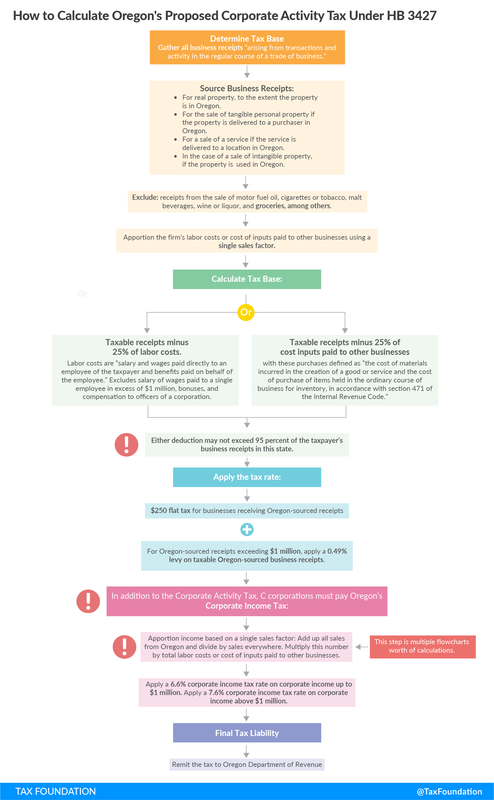 As the figure below illustrates, the process of calculating, filing, and remitting the proposed tax will create complexity for businesses operating in Oregon. The partial relief businesses get from the 25 percent deduction for labor costs or the cost of business inputs is made up for by the complexity of the tax. In addition to the proposed Corporate Activity Tax, Oregon C corporations will need to calculate and remit the state corporate income tax. This would make Oregon the second state in the country to levy a statewide gross receipts tax in addition to a state corporate income tax, joining Delaware. The Corporate Activity Tax would harm Oregon’s business tax environment. Oregon is currently ranked 7th overall in our 2019 State Business Tax Climate Index (SBTCI). Oregon’s lack of a state sales tax and relatively well-structured property tax puts the state’s business tax environment in the top 10 in the country. If Oregon levies the Corporate Activity Tax, we project that Oregon will fall from 7th to 12th overall on the SBTCI, and from 30th to 49th in corporate taxes, just behind Delaware. Low-income households will be hardest hit from the tax, as they will not be able to benefit from the individual income tax rate reductions. These households often have little to no tax liability but will pay higher prices for goods and services. Oregon’s Legislative Revenue Office (LRO) estimates that the households with incomes below about $20,500 will see their incomes decline by $85 annually on average. While this may not seem like a large amount for higher-income households, this income may be critical for low-income Oregonians to make ends meet. Gross receipts taxes like this proposal are economically harmful and inefficient methods of raising revenue. At the minimum, a refundable tax credit targeted at low-income households would help reduce the regressive nature of the tax. Ideally, policymakers should restructure the tax to exempt business inputs through a value-added tax. This would produce fewer price increases and less harm for low-income households, all while raising the revenue needed to improve public education. Tax reform is hard. But sometimes local tax reform makes it look easy, particularly when those reforms involve a state-for-local tax swap. Currently, both Texas and Nebraska are considering state-for-local tax swaps, but they’re running into an old problem: frequently, only a net tax cut can ensure that most taxpayers are not worse off, while only a tax increase can hold local governments harmless. Local revenue systems are often a hodgepodge of taxes, old and new. Mainstays like the property tax or often a local option sales tax coexist uneasily with head taxes, inventory taxes, occupation taxes, and license taxes, some of them evolved from peddler’s taxes or other archaic forms of taxation. Tangible personal property taxes, though widely regarded as economically inefficient, hang on in many states, and sometimes so do gross receipts taxes, for all their acknowledged flaws. In some states, a constellation of small, inefficient local revenue sources can be so widely acknowledged as flawed to earn the appellation “nuisance taxes”—in official state publications! Policymakers are often interested in eliminating certain taxes, because they’re inefficient, unpopular, volatile, or for any number of other reasons. If, however, the taxing authority cannot afford to forgo the lost revenue from repeal, a replacement revenue is needed—hence the tax swap. The term “tax swap” often carries negative connotations, but it need not. Most tax reforms involve shifting liability among taxes to some degree, and sometimes one or more taxes outright replace another. Almost all states’ current tax codes are the result of an epochal shift in state taxation beginning about a century ago, when states scrapped their statewide property taxes and began to replace the collections with income and sales taxes. Proposals to modernize sales taxes often involve tax swaps (broadening the sales tax base and using some of the revenue to pay down rate reductions elsewhere), and can promote equity, stability, and economic efficiency. Lesser rebalancing of revenue sources happens with regularity, designed to increase efficiency, equity, simplicity, or some other policy aim. Each swap must be considered on its own merits: some would improve state tax codes, while others may increase their complexity or undermine a state’s competitiveness. But the concept of the tax swap is itself neutral. When, however, a state revenue source is swapped for a local one, the complexity of the swap increases markedly. This does not mean that no state-for-local swaps are worth doing, but it does require careful deliberations, as the mechanics of a state-for-local tax swap are considerably more intricate than those of replacing one state revenue stream with another. In theory, four kinds of tax swaps are possible within state and local taxation: state-for-state, state-for-local, local-for-state, and local-for-local. A state increasing its gas tax, tied to a reduction in the sales tax rate, is a state-for-state tax swap. A state wiping out a locally-levied gross receipts tax in exchange for aid to localities funded by state income taxes is a state-for-local tax swap. Although rarely done explicitly, a reduction in state tax rates tied to new local spending mandates might be seen as a local-for-state tax swap, particularly if accompanied by new local revenue authority. And a locality paying down the repeal of some of its nuisance taxes with a slight property tax increase would be engaging in a local-for-local tax swap. Notably, local-for-local swaps might be initiated by a given locality or could be mandated by state government. Distributional impacts must be grappled with where any tax change is concerned; they are not limited to tax swaps. For a tax swap involving a single level of government (state-for-state or local-for-local), the impact of distributional changes takes place at the taxpayer level (that is, changes in individual taxpayers’ overall liability). Where two levels of government are involved, however, they also take place at the governmental level. The same can also be true when states mandate a local-for-local tax swap, depending on the swap’s design. Texas is currently considering an increase in the state sales tax to pay down reductions in local property tax millages, while Nebraska is contemplating using the sales tax to engineer property tax relief in the form of modified assessment ratios and tax credits. Other states have gone down this path, and they’ve learned just how complex it can be. The new revenue stream will, necessarily, have a different economic incidence than the one it replaces. It is likely to have a different geographic footprint as well. However the state chooses to disburse the resulting revenue to localities, there are bound to be difficulties. For the sake of narrative simplicity, let us use a generic version of the Texas and Nebraska proposals—a state sales for local property tax swap—though the basic analysis would apply to other state-for-local tax swaps as well. Obviously, as a starting point, taxable property and taxable sales are not proportional to each other. Some jurisdictions may have high property values but relatively little retail, hence low sales tax collections. Others may have large retail corridors, but struggle with the rest of the property tax base. How much tax is collected from each geographic region, and from each income class, will change under the swap. Thus far, this is not unique; the same would happen with a tax swap on a single level of government. Here, however, the second-order effect takes place: not only do collections change, but local distributions do as well. Having collected the revenue, the state must decide now to allocate it to localities. Policymakers might opt to distribute it proportionally to the revenue being replaced, such that a locality collecting 5 percent of the state’s overall property tax revenue would receive 5 percent of the replacement revenue. This approach rewards the jurisdictions with the highest property tax collections, which could be a combination not only of the properties with the highest assessed values but also those with the highest rates. Jurisdictions which exercised greater frugality might reasonably object to their tax dollars being siphoned off to provide additional aid to jurisdictions which have historically imposed higher taxes. If, as in Texas and Nebraska, only a partial replacement of the property tax is intended, local policymakers (and the voting public, to the extent that they have to approve rate increases) have an incentive to raise property tax rates and cut other taxes—which runs directly counter to legislative intent—because higher property taxes yield a higher state revenue match. In a scenario where the property tax was repealed outright (which is not part of the proposal in either state), tax collections at a particular point in time could serve as the basis for a redistribution formula indefinitely, with increasingly indefensible results as time passes. Alternatively, revenue could be distributed based on population, which—in a sales tax for property tax cut swap—would redistribute revenue to higher-density areas, particularly if property tax relief is limited to owner-occupied housing. This could be an explicit policy goal, or it might not, particularly if the intention was property tax relief. Property taxes might be lower, but those who faced the highest overall property tax burdens might—lower property taxes notwithstanding—shoulder an even greater tax burden. Relief only targeted to owner-occupied housing, meanwhile, can be perversely regressive, since rental properties are generally classed as commercial property. Renters—many of them lower-income—would thus pay the higher sales tax without getting the benefit of any property tax relief. It might be allocated based on where the additional sales tax is collected (destination sourcing), which makes it functionally like a mandatory local-for-local swap. Or revenues could be distributed by some other formula. If the goal is to offset educational costs, for instance, it might be allocated according to a school funding formula that reflects educational needs. Such an approach might have merit—but as a school finance measure, not purely or primarily as a tax swap. In both Indiana and Michigan, for instance, state government assumed greater responsibility for education funding, with revenue earmarked from the state sales tax. To avoid (or at least limit) increased levels of overall taxation, mechanisms were put in place to reduce local property taxes in line with the reduced local responsibility for school funding. These policies should be understood, primarily, as school funding equalization measures, not property tax relief. The distributional changes—for individuals and taxing jurisdictions—were the goal, not an unintended consequence of a tax swap. This is the quandary of a state-for-local tax swap: the only way to ensure that most taxpayers are not worse off is often to design the swap as a substantial net tax cut, while the only way to hold local governments harmless may be to engineer a substantial tax increase. Even if, overall, the tax swap does not immediately increase tax burdens within a given jurisdiction, moreover, it might well end up that way. This is one of the biggest objections to state-for-local tax swaps, and while there are mechanisms to mitigate the risk, it is difficult to avoid it altogether. Typically, proposals for a tax swap impose some sort of rollback or repeal requirement for the targeted local tax. So, for instance, property tax millages might have to decline by 20 percent, or capped below current levels, or be subject to reduction by the amount necessary to ensure a dollar-for-dollar reduction against the new local aid. Each approach has its own implications for local budgets. Equally importantly, however, is that it is difficult to ensure that the rates remain lower because of the tax swap. Local governments tend to enjoy some autonomy in rate-setting, though they are subject to property tax limitations of varying levels of efficacy. Once rates are rolled back due to a tax swap, state officials can impose limits on the growth of tax collections (often called levy limits) to prevent local tax jurisdictions from reverting to their old rates while pocketing the new state aid, but most limits permit some growth factor and often authorize voter overrides. If property taxes are suddenly lower—even if other taxes have, with little transparency, risen to offset them—localities could easily max out their annual growth, or even secure voter approval to raise rates outside the cap, resulting in net tax increases while failing in the ostensible rationale for the swap: lowering property taxes. In sum, state-for-local tax swaps are difficult to get right, both as a matter of policy design and practical politics. There are cases in which a state-for-local tax swap is still worth doing, because the targeted tax is so inefficient, or in service of other (non-tax) policy aims. There may, moreover, be options for other kinds of tax swaps, or for granting local governments greater authority to engineer their own local-for-local tax swaps tailored to their aims. At times, it may be appropriate for state government to mandate local participation, repealing authority for a given tax and perhaps replacing it with different tax authority. Any such proposals require thoughtful deliberation, but some remain well worth doing. The potential moral hazards of a state-for-local tax swap, however, require a particularly cautious approach. Policymakers should want to know the details and contemplate the ramifications, avoiding the temptation to view a swap as an easy solution to goals like property tax relief. In an increasingly globalized world, many individuals and corporations work and do business abroad. As a result, jurisdictions need to define how income earned in foreign countries is taxed. Otherwise, income could be taxed in more than one country, resulting in double taxation. To avoid this, countries have negotiated double tax agreements (DTAs). These tax treaties align many tax laws between two countries. They usually provide mechanisms to eliminate double taxation of business and wage income earned by individuals who live or have their main income in one country but (temporarily) work in another country. Additionally, they often include the mutual reduction or elimination of withholding taxes on interest, dividends, and royalties earned by foreign individuals and corporations. Tax treaties can provide certainty and stability for taxpayers, reduce tax evasion, and encourage foreign investment and trade. A broad network of tax treaties thus contributes to the competitiveness of an economy. The United Kingdom has the broadest network of tax treaties in Europe (131 countries), reflecting its long economic and political history of global trade and investment. The UK is followed by France (107 countries) and Italy (102 countries). 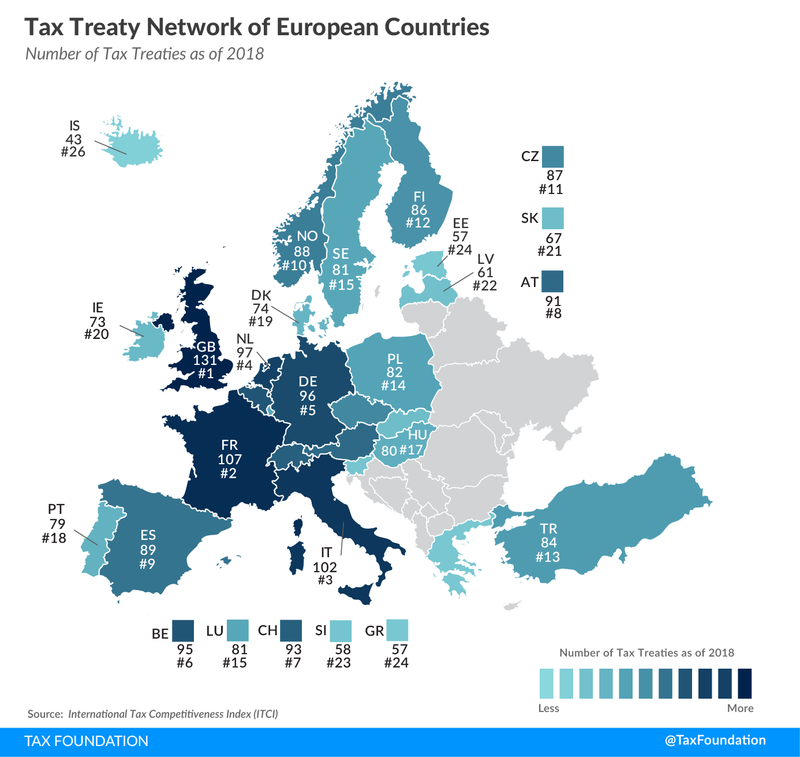 The countries with the smallest network of tax treaties are Iceland (43 countries), Greece (57 countries), and Estonia (57 countries). On average, the European countries covered hold 82 double tax agreements. The Real Corporate Profits Tax would be equal to 7 percent of a corporation’s profits as reported on its financial statement with an exemption for the first $100 million in profits. According to the Tax Foundation Model, the Real Corporate Profits Tax would reduce long-run output by 1.9 percent, shrink the capital stock by 3.3 percent, and reduce wages by 1.5 percent. The Real Corporate Profits Tax would raise approximately $872 billion between 2020 and 2029 on a conventional basis. The smaller projected economy over the next decade would result in lower individual income, payroll, and excise tax revenue collections. As a result, we estimate that this tax would increase federal revenue by $476 billion between 2020 and 2029 on a dynamic basis. The Real Corporate Profits Tax would reduce after-tax income for taxpayers at all income levels. However, it would raise taxes more for high-income taxpayers, increasing the progressivity of the U.S. tax code. Senator Elizabeth Warren released a proposal to enact a surtax on U.S. corporations. According to the Warren campaign, the “Real Corporate Profits Tax” would be equal to 7 percent of the worldwide profits reported on a corporation’s financial statement. The first $100 million in profits of a corporation would be exempt from the tax. According to Senator Warren, the goal of this policy is to prevent companies that report profits to their shareholders in a given year from paying little to no federal income tax. The senator’s aim is to close the “book-tax” gap in profits. Under current law, companies have an incentive to report high profits to their shareholders while reporting low profits to the IRS. This tax would be based entirely on book profits to reduce this incentive. According to the Tax Foundation General Equilibrium Model, this proposal would reduce economic output (GDP) by 1.9 percent in the long run. We also estimate that the capital stock would be 3.3 percent smaller and wages 1.5 percent lower, with about 454,000 fewer full-time equivalent jobs. The Real Corporate Profits surtax would reduce output primarily through an increase in the service price of capital, or the required return necessary for investment to break even, after tax and depreciation, in the United States. We estimate that the service price would rise by 2.6 percent under this proposal. A higher service price means that capital investment would become less attractive, leading to reduced investment and, eventually, a smaller capital stock. The smaller capital stock would lead to lower output, lower worker productivity, and lower wages. Notably, the surtax would have a larger negative impact on the incentive to invest in the United States than a 7 percentage-point increase in the corporate income tax rate. This is chiefly because companies would not be able to use expensing or accelerated depreciation for their capital investments. The extent to which the corporate income tax distorts investment decisions depends largely on how much of a given investment can be deducted against taxable income in present value. Under current law, companies can expense, or deduct immediately, short-life assets against their taxable income. Long-life assets qualify for accelerated depreciation. The result is that many investments are exempt or partially exempt from taxation. Under the surtax, however, companies would not have access to expensing. The result is that all investment would be fully subject to the surtax. Other aspects of the surtax would also distort corporate investment behavior. It appears that companies would not be able to carry forward losses into future years. As a result, investments that might lose money for several years before turning a profit could face high effective tax rates. Based on descriptions of the plan, the surtax also would include foreign income in its tax base with no deduction or credit for foreign taxes. This would make it less likely for U.S. companies to own foreign investments and would ultimately reduce national income. We estimate that the Real Corporate Profits Tax would raise $872 billion between 2020 and 2029 on a conventional basis. Corporate tax collections would be $79 billion higher in 2020. Over the next decade, collections would grow as corporate profits increase with the U.S. and world economy. By 2029, the surtax would raise $102 billion. Source: Tax Foundation General Equilibrium Model, March 2019. Values may not add to total due to rounding. On a dynamic basis, the proposal would raise $476 billion over the same period. The smaller revenue collections on a dynamic basis are due to lower output over the next decade. Wages and profits would be lower, reducing revenue collections from the individual income tax, payroll tax, and excise taxes. Revenue from these taxes would be $396 billion lower over the next decade as a result of the proposal. According to the Tax Foundation General Equilibrium Model, the Real Corporate Profits Tax would make the tax code more progressive. However, taxpayers at all income levels, on both a conventional and dynamic basis, would see a reduction in after-tax income. On a conventional basis, the bottom 80 percent of income earners would see a reduction in after-tax income of between 0.49 percent and 0.59 percent. Taxpayers in the 80th to 99th percentile would see a slightly larger reduction in after-tax income of between 0.64 and 0.89 percent. The top 1 percent of taxpayers would see a much larger reduction in after-tax income of 2.35 percent. Overall, after-tax income would fall by 0.93 percent. On a dynamic basis, the smaller economy would result in an even larger drop in after-tax income. Taxpayers in the bottom four income quintiles (0% to 20%, 20% to 40%, 40% to 60%, and 60% to 80%) would see a reduction in after-tax income of between 1.64 percent and 1.95 percent. Taxpayers in the 80th to 99th percentile would see a slightly larger reduction in after-tax income of between 1.67 and 2.16 percent. Taxpayers in the top 1 percent would see a 4.16 percent drop in after-tax income. Source: Tax Foundation General Equilibrium Model, March 2019. In general, the corporate income tax falls on the owners of capital (shareholders) and workers. Shareholders bear the burden of the corporate tax directly through reduced after-tax returns on their investments. Workers bear the burden of the corporate tax indirectly through reduced compensation. The share of the corporate tax borne by workers depends on how the corporate income tax impacts the incentive to invest. As mentioned previously, the Real Corporate Profits Tax would distort investment decisions by subjecting corporate investment to additional taxation. As such, this tax would fall on U.S. workers in the form of lower wages. We should also expect that this surtax would fall more heavily on workers, through lower wages, than the current corporate tax because it would fall more heavily on investment than the current corporate tax. It is also worth nothing that the exemption for the first $100 million doesn’t necessarily contribute to the progressivity of the surtax. The annual profitability of a company doesn’t correspond to the well-being of those who ultimately bear the burden of the tax. A large corporation with more than $500 million in profits may be owned by a broad pool of shareholders with modest incomes. In contrast, a small, closely-held corporation that earns $50 million in profits, and falls under the threshold, might only have two high-income owners. Senator Elizabeth Warren (D-MA) introduced a 7 percent surtax on corporate profits called the “Real Corporate Profits Tax.” We estimate that this tax would reduce the incentive to invest in the United States, and result in a 1.9 percent smaller economy, a 3.3 percent smaller capital stock, and 1.5 percent lower wages. The surtax would raise $872 billion between 2020 and 2029 on a conventional basis and $476 billion on a dynamic basis. The tax would make the tax code more progressive, but it would fall on taxpayers in every income group. We use the Tax Foundation General Equilibrium Tax Model to estimate the impact of tax policies. The model can produce both conventional and dynamic revenue estimates of tax policy. Conventional estimates hold the size of the economy constant and attempts to estimate potential behavioral effects of tax policy. Dynamic revenue estimates consider both behavioral and macroeconomic effects of tax policy on revenue. The model can also produce estimates of how policies impact measures of economic performance such as GDP, wages, employment, the capital stock, investment, consumption, saving, and the trade deficit. Lastly, it can produce estimates of how different tax policy impacts the distribution of the federal tax burden. This analysis is based on details released by Senator Warren and her advisors. Ultimately, the impact of the proposal depends on its final details. In estimating the impact of the surtax, we assumed that the 7 percent tax would apply only to C corporations (excluding S corporations, Partnerships, LLC, and Sole Proprietorships). We also assumed that the tax base would be equal to book profits minus an exclusion of $100 million. There would be no deductions or credits for taxes paid, nor would companies be able to carry forward losses to future years. To calculate the revenue effect of the surtax, we started with the current corporate income tax base and then adjusted taxable income to bring it closer to book profits. For example, companies would no longer benefit from expensing and accelerated depreciation, deductions for local, state, and foreign taxes, credits for specific activities, or the foreign tax credit. Foreign profits would be fully taxed each year. We also assume that companies would not receive deductions for losses. Companies would also not be subject to any special taxes or limitations such as BEAT, GILTI, FDII, or the limitation on net interest expense deductions. In distributing the corporate income tax on a conventional basis, we assume that 50 percent of the corporate tax is borne by labor and 50 percent by capital. On a dynamic basis, we assume that 50 percent of the corporate tax is borne by shareholders as a change in after-tax income, then changes in economic output are distributed to labor and capital in proportion to their share of total output. We do not explicitly model this effect. Stephen J. Entin, Huaqun Li, and Kyle Pomerleau, “Overview of the Tax Foundation’s General Equilibrium Model,” Tax Foundation, April 2018 Update,” https://files.taxfoundation.org/20180419195810/TaxFoundaton_General-Equilibrium-Model-Overview1.pdf. These assumptions are similar to those made by University of California, Berkeley economics professors Emmanuel Saez and Gabriel Zucman in a letter to Senator Warren, https://elizabethwarren.com/wp-content/uploads/2019/04/Saez-and-Zucman-Letter-on-Real-Corporate-Profits-Tax-4.10.19-2.pdf. Stephen J. Entin, Tax Foundation, Oct. 24, 2017, “Labor Bears Much of the Cost of the Corporate Tax,” Tax Foundation, https://taxfoundation.org/labor-bears-corporate-tax/. Huaqun Li and Kyle Pomerleau, “The Distributional Impact of the Tax Cuts and Jobs Act over the Next Decade,” Tax Foundation, June 28, 2018, https://taxfoundation.org/the-distributional-impact-of-the-tax-cuts-and-jobs-act-over-the-next-decade/.